Giampietrino (1495–1549), copy after Leonardo da Vinci (1452–1519), The Last Supper (c 1520), oil on canvas, 298 x 770 cm, The Royal Academy of Arts, London. Wikimedia Commons. Through the 1490s Leonardo was an integral part of the court in Milan, as its ruler Ludovico il Moro consolidated his power there. In 1489, Leonardo was engaged to design and cast the Sforza equestrian monument, a project which was terminated in 1494 when the bronze for the casting was sequestered to make cannons, and never reprovided. He was also still struggling on with his unfinished commission for The Virgin of the Rocks, and drew prolifically. Leonardo da Vinci (1452–1519), Vitruvian Man (c 1492), pen, ink and wash on paper, 34 x 24 cm, Gallerie dell’Accademia, Venice, Italy. Image by Luc Viatour / https://Lucnix.be, via Wikimedia Commons. 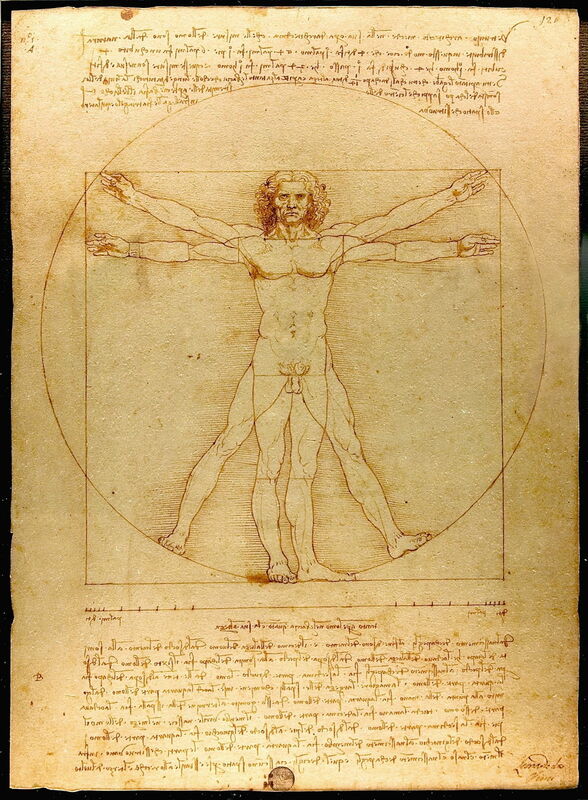 One of his best-known drawings from this period is this Vitruvian Man, from around 1492. This is based on the correlations of ideal body proportions with the geometry detailed by the Roman architect and geometer Vitruvius, hence its name. This is the most prominent of a long series of geometric studies of the ideal proportions of human bodies through the history of art, and represents the confluence of art and mathematics, so appropriate for Leonardo’s wide-ranging interests. By the mid 1490s, he was deeply involved in his next major project, a wall painting for one end of the refectory of the reformed Dominican Convent of Santa Maria delle Grazie in Milan. This may seem an obscure location for what was very quickly to become one of the world’s greatest works of art, but Ludovico il Moro dined there twice a week, and it had recently been remodelled as a mausoleum for the Sforza family. Leonardo’s Last Supper was therefore a court painting first and foremost. Leonardo da Vinci (1452–1519), The Last Supper (1498), mixed oil and tempera on plaster, 460 x 880 cm, Convent of Santa Maria delle Grazie, Milan. Wikimedia Commons. 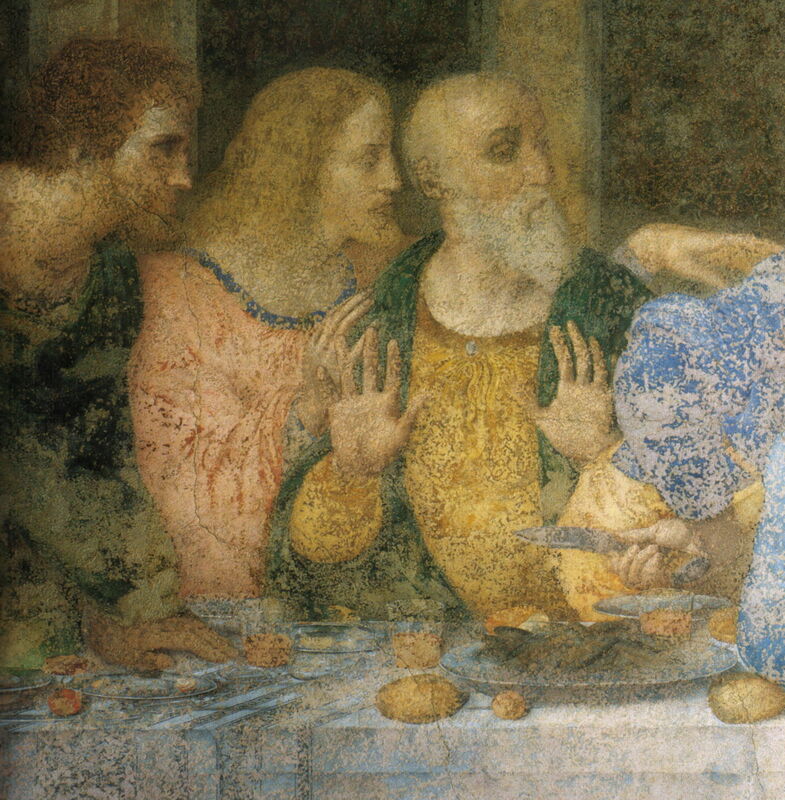 Leonardo’s innovation was tragically almost the undoing of The Last Supper (c 1495-97). What we see on the refectory wall now is a pale and changed reflection of the magnificent work which he painted, because of his choice of media and seemingly endless attempts to repaint sections over the centuries since. These are most apparent when you look at a detail such as that below. Leonardo da Vinci (1452–1519), The Last Supper (detail) (c 1495-97), mixed oil and tempera on plaster, 460 x 880 cm, Convent of Santa Maria delle Grazie, Milan. Wikimedia Commons. Instead of painting this using established fresco technique into wet plaster, Leonardo first applied a chalk ground with glue binder, on top of which he painted relatively thickly in egg tempera, possibly with oil paint too. This has been obscured by a long succession of attempts to make good its deteriorating paint layer, often by applying oil paint on top of its unstable base. 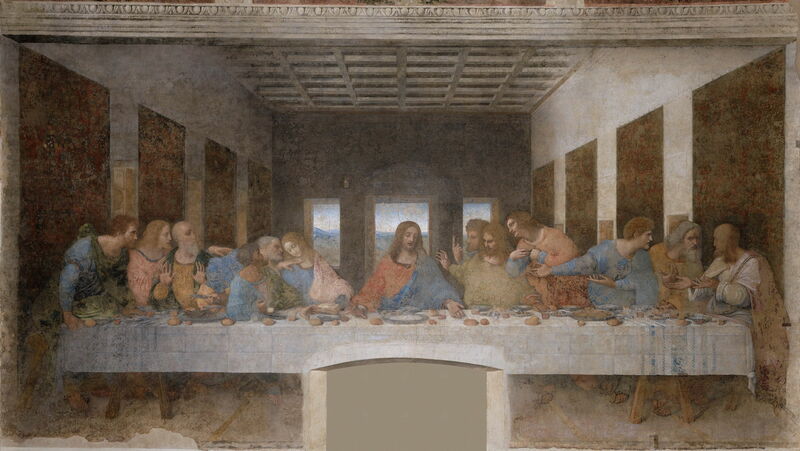 Fortunately, a full size copy was made just over twenty years after Leonardo completed The Last Supper, by Giampietrino, who is thought to have worked closely with Leonardo when they were both in Milan. Giampietrino’s copy of the The Last Supper from about 1520 gives the closest impression today of what the original must have looked like. Even this copy has been horribly mutilated: the upper third was cut off, and its width reduced, but at least what remains gives a better idea of the original’s appearance. Leonardo’s composition wasn’t entirely revolutionary for the time. Previous paintings of The Last Supper had spread the apostles along the length of a table, with Christ at its centre. However, Judas Iscariot was usually placed alone on the near side, his back to the viewer, and sometimes with his bag of silver visible behind his back. Leonardo shows the moment of surprise and denial when Christ announces that one of those sat around the table would betray him. In this, Leonardo was perhaps the first artist to assemble the apostles into small groups, a feature which has been repeated in innumerable images which have followed this painting. For not only must this be one of the greatest works of art, it must have spawned more copies and parodies than any other too. 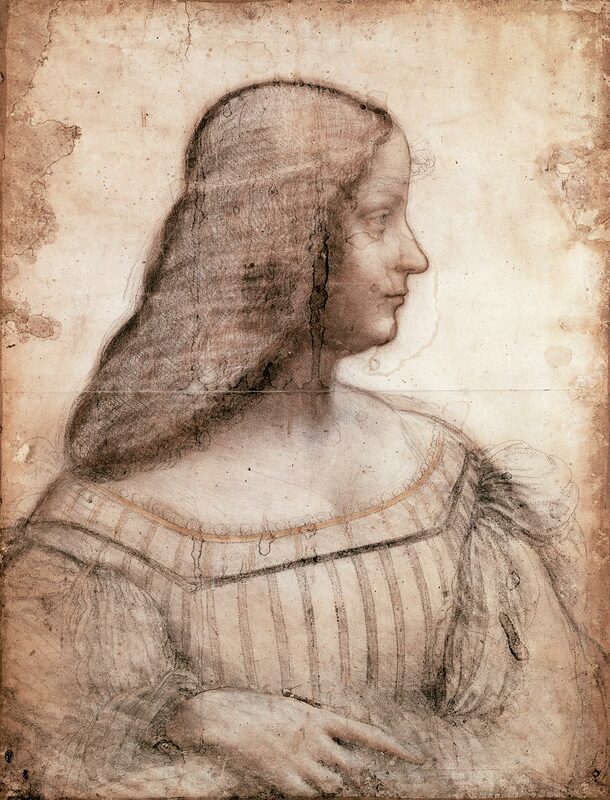 Leonardo da Vinci (1452–1519), Portrait of Isabella d’Este (c 1499-1500), black and red chalk with stump, ochre chalk, white highlights, on paper, 61 x 46.5 cm, Musée du Louvre, Paris. Image by RMN / Michèle Bellot, via Wikimedia Commons. After completing The Last Supper, Leonardo made this Portrait of Isabella d’Este (c 1499-1500) in chalk. Isabella (1474-1539) was the Marchioness of Mantua, a major patron of the arts, and sister to Beatrice d’Este, the wife of Ludovico. There is no evidence that Leonardo ever used this cartoon for a painting of her. 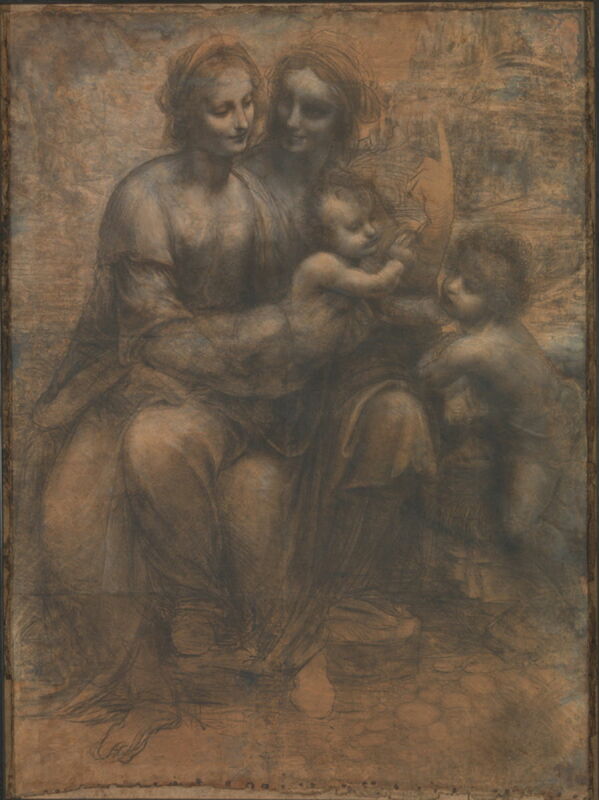 Leonardo da Vinci (1452-1519), The Virgin and Child with Saint Anne and the Infant Saint John the Baptist (The Burlington House Cartoon) (c 1499-1500), charcoal (and wash?) heightened with white chalk on paper, mounted on canvas, 141.5 x 104.6 cm, The National Gallery (Purchased with special grants, 1962), London. Courtesy of and © The National Gallery, London. 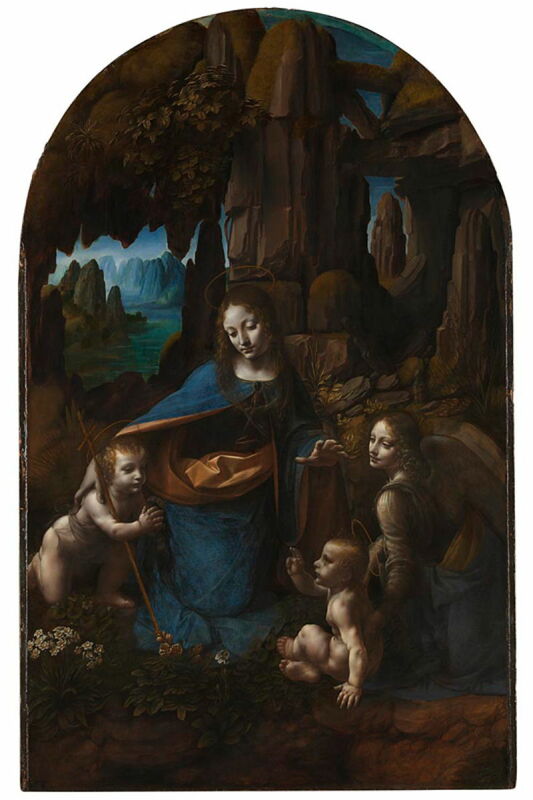 Another of Leonardo’s famous cartoons is that of The Virgin and Child with Saint Anne and the Infant Saint John the Baptist, popularly known as The Burlington House Cartoon, from about 1499-1500. 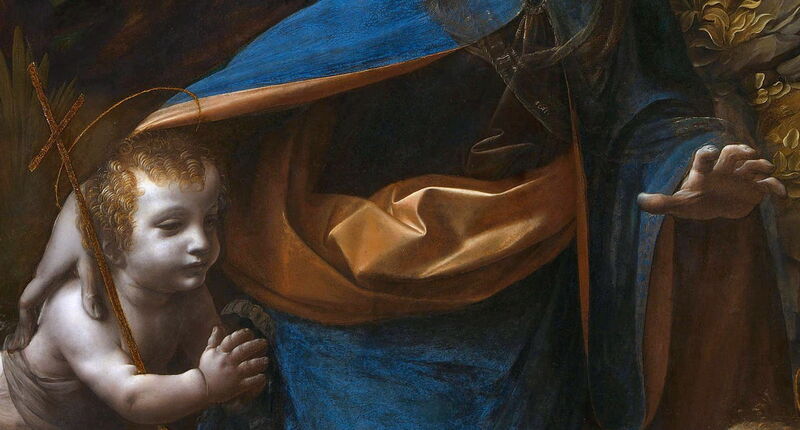 Again, there is no evidence that this was ever turned into a painting by Leonardo, but it appears to have evolved through other studies into his Virgin and Child with Saint Anne (c 1503-19), now in the Louvre. His other major painting from this period was the culmination of the commission for the altarpiece of the Confraternity of the Immaculate Conception of San Francesco Grande in Milan: the second version of The Virgin with the Infant Saint John the Baptist adoring the Christ Child accompanied by an Angel, or The Virgin of the Rocks, now one of the diamonds in the crown of London’s National Gallery. This second version has been far more fortunate in its care over the last half millenium, and small improvements in composition and details bring significant enhancements. These include addition of the crucifix held by the infant John the Baptist, and removal of the palm leaves from the background, whatever they might have signified. There is dispute, though, over the origin of this painting. Some authorities have argued that this wasn’t painted by Leonardo, but was a copy, either of the first version or of a second version which has since been lost. There is also the mystery that it appears unfinished, for instance in the right hand of the angel. It is thought by some that Leonardo painted most of this version between about 1495-99, following which the commission remained incomplete. Then between 1506-08 he returned to make some late changes, after which it was delivered and accepted. It is also of technical interest that the prominent light brown lining of the Virgin’s blue cloak, shown so well in the detail below and distinct from the first version, contains lead-tin yellow type I. By this time, Leonardo’s fortunes had changed. In 1498, King Louis XII of France invaded the Duchy of Milan, and Ludovico ended up a prisoner in France. Leonardo fled first to Venice, where he worked primarily as a military engineer. It was perhaps there that he made The Burlington House Cartoon, before going on to Cesena in 1502, where he served Cesare Borgia as military architect and engineer. In 1503, Leonardo returned to his home city of Florence, where he was to create the most famous easel painting in Europe. Posted in General, Life, Painting and tagged da Vinci, Giampietrino, Last Supper, painting, Vitruvian. Bookmark the permalink. I don’t often comment because your posts are so packed with thoughtful scholarly content I have much to ponder and learn! I do read and enjoy them. Just wondering – are you collecting these articles for future publication? I have looked at putting some of them together, perhaps for Apple’s Bookstore. There are some significant issues, though, not least access to all the paintings. Here they’re free and non-commercial, so I don’t have to get permission or pay fees (generally). But published in any form of book, that gets more complex. So I spend my time writing more, rather than trying to work out how to publish them.